TtT/GF is a mouse cell line derived from a thyrotropic pituitary tumor and has been used as a model of folliculostellate cells. Our previous microarray data indicate that TtT/GF possesses some properties of endothelial cells, pericytes and stem/progenitor cells, along with folliculostellate cells, suggesting its plasticity. We also found that transforming growth factor beta (TGFβ) alters cell motility, increases pericyte marker transcripts and attenuates endothelial cell and stem/progenitor cell markers in TtT/GF cells. The present study explores the wide-range effect of TGFβ on TtT/GF cells at the protein level and characterizes TGFβ-induced proteins and their partnerships using stable isotope labeling of amino acids in cell culture (SILAC)-assisted quantitative mass spectrometry. 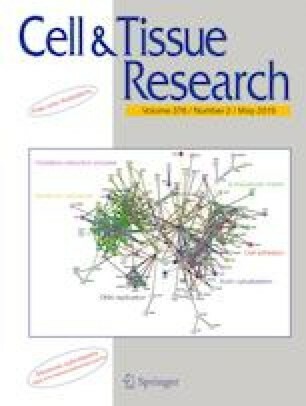 Comparison between quantified proteins from TGFβ-treated cells and those from SB431542 (a selective TGFβ receptor I inhibitor)-treated cells revealed 51 upregulated and 112 downregulated proteins (|log2| > 0.6). Gene ontology and STRING analyses revealed that these are related to the actin cytoskeleton, cell adhesion, extracellular matrix and DNA replication. Consistently, TGFβ-treated cells showed a distinct actin filament pattern and reduced proliferation compared to vehicle-treated cells; SB431542 blocked the effect of TGFβ. Upregulation of many pericyte markers (CSPG4, NES, ACTA, TAGLN, COL1A1, THBS1, TIMP3 and FLNA) supports our previous hypothesis that TGFβ reinforces pericyte properties. We also found downregulation of CTSB, EZR and LGALS3, which are induced in several pituitary adenomas. These data provide valuable information about pericyte differentiation as well as the pathological processes in pituitary adenomas. Takehiro Tsukada, Yukinobu Isowa and Keiji Kito contributed equally to this work. The online version of this article ( https://doi.org/10.1007/s00441-018-02989-2) contains supplementary material, which is available to authorized users. We would like to thank Tom Kouki (Jichi Medical University) for his support in transmission electron microscopy and Editage (www.editage.jp) for English language editing. This work was partially supported by the Japan Society for the Promotion of Science KAKENHI Grants (Numbers 16K18818 to SY, 26460281 to KF, 16K08475 to KH, 26292166 to YK and 15K07771 to TK), the MEXT-supported Program for the Strategic Research Foundation at Private Universities (2014–2018), the Meiji University International Institute for BioResource Research (MUIIR) and start-up funds to TT from the Faculty of Science Department at Toho University.